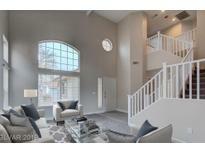 Below you can view all the homes for sale in the Heritage Place subdivision located in Las Vegas Nevada. Listings in Heritage Place are updated daily from data we receive from the Las Vegas multiple listing service. To learn more about any of these homes or to receive custom notifications when a new property is listed for sale in Heritage Place, give us a call at 702-930-8014. Backyard has grass area, covered patio, gated pool, and paved sitting area. MLS#2088340. Precision Realty. To help visualize this home's floorplan and highlight it's potential, virtual furnishings may have been added to photos found in listing. MLS#2066073. Choice One Properties & Manage.